It may sound weird to some of you, but I promise that it is delicious. If you like Coconut and you like Turkey Bacon, then you will LOVE this recipe. I will admit right now, it is not the healthiest snack you can have, but can make for a nice treat once when you are really craving something both sweet and savory. 1. Crack 1 egg in a bowl and stir with a whisk or fork. 2. Place the shredded coconut on a large plate and spread it out evenly. 3. Oil a frying pan using 2 tbsp. of coconut oil and put the frying pan on the stove top at low-medium heat. 4. Coat one strip of turkey bacon at a time with the egg that was mixed in the bowl. This can easily be done by dipping the entire turkey bacon strip in the bowl. 5. 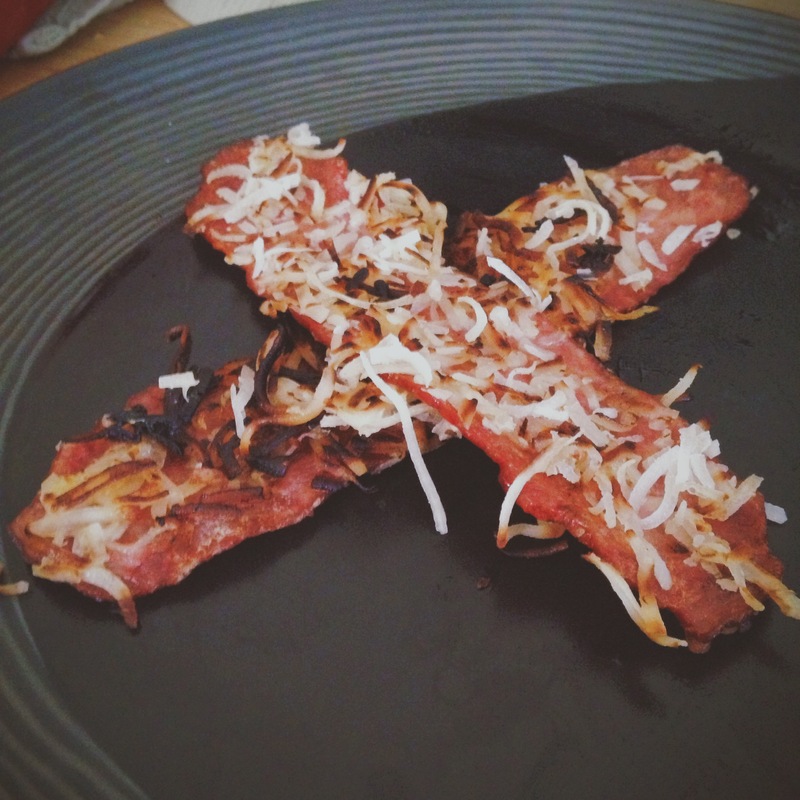 Place the coated turkey bacon strip on the plate with the shredded coconut. Coat the strip on both sides with shredded coconut. 6. Place the turkey bacon strip on the frying pan and let it sit for about 1 minute. After one minute, flip the turkey bacon strip and cook for an additional minute. The reason we do not fry the bacon for too long is because the coconut will easily blacken if cooked too long. We want the coconut to be golden brown. 7. Remove the strip from the frying pan and place it on a plate that is covered by a paper towel. 8. Continue the process from step 4-7 for the other 7 pieces of turkey bacon. Once you have finished cooking all of the pieces, you should have 8 coconut coated, turkey bacon strips on one plate. 9. Place a paper towel over the turkey bacon and put the plate in the microwave. Cook on high for 2-3 minutes or until the turkey bacon has a consistency you like. 10. Let the plate cool and ENJOY! Do you like this recipe? Do you have any recipes you would like to share? Email me at corestrengthalec@gmail.com with any questions, comments, or ideas for new topics.